Research into Natural Language Processing - the use of computers to process language - has developed over the last couple of decades into one of the most vigorous and interesting areas of current work on language and communication. This book introduces the subject through the discussion and development of various computer programs which illustrate some of the basic concepts and techniques in the field. The programming language used is Prolog, which is especially well-suited for Natural Language Processing and those with little or no background in computing. 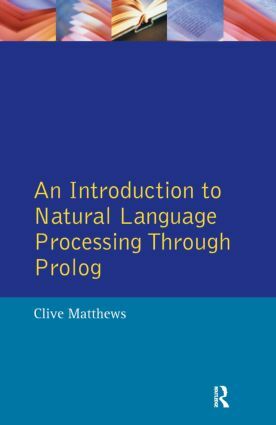 Following the general introduction, the first section of the book presents Prolog, and the following chapters illustrate how various Natural Language Processing programs may be written using this programming language. Since it is assumed that the reader has no previous experience in programming, great care is taken to provide a simple yet comprehensive introduction to Prolog. Due to the 'user friendly' nature of Prolog, simple yet effective programs may be written from an early stage. The reader is gradually introduced to various techniques for syntactic processing, ranging from Finite State Network recognisors to Chart parsers. An integral element of the book is the comprehensive set of exercises included in each chapter as a means of cementing the reader's understanding of each topic. Suggested answers are also provided. An Introduction to Natural Language Processing Through Prolog is an excellent introduction to the subject for students of linguistics and computer science, and will be especially useful for those with no background in the subject. Clive Matthews is a lecturer in Linguistics at the University of East Anglia. Learning about Language is an exciting and ambitious series of introductions to fundamental topics in language, linguistics and related areas. The books are designed for students of linguistics and those who are studying language as part of a wider course.